Even before the first image appears, you know you’re in for a good ride. Voices of news anchors are heard sharing the news of a boy’s kidnapping. The man shown on a T.V. screen to be the abductor is standing in a barricaded motel room, while an accomplice, noticeably armed, looks outside. A small human form, sitting under an illuminated bedsheet, is revealed to be a young boy in swimming goggles reading a Superman comic book with a flashlight. All three leave in an aging ‘70s car, racing through an empty highway. The music intensifies. The driver cuts off the car’s lights, putting on night-vision goggles, and the vehicle dissolves into the night. Now you’re left staring at an essentially black screen, and you couldn’t feel any more ecstatic. The mostly unspoken but evident father-son connection is the emotional heart of this film. That is one of the coolest and most gripping opening scenes I’ve seen in a long time. 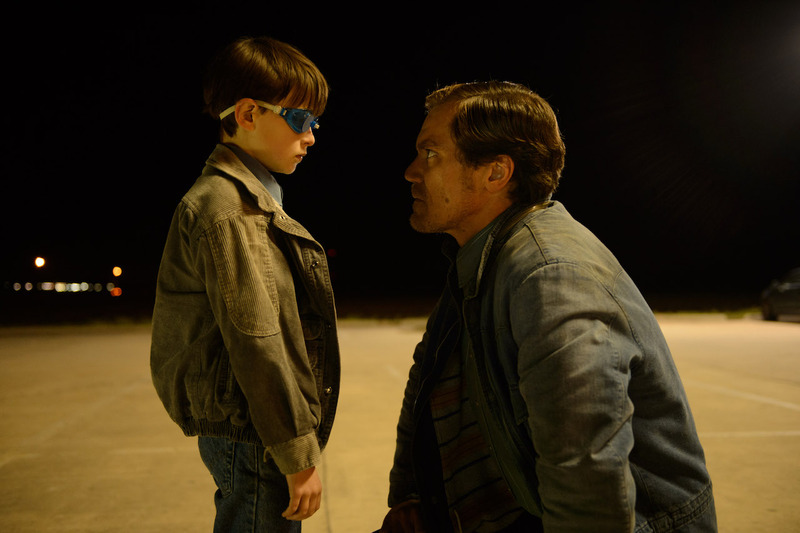 A film usually builds to a high, but Midnight Special starts with one, and maintains it almost all the way through. An original, genre-defying mixture of the old, the new and the eternal, Jeff Nichols’ fourth film confirms the American director as one of this decade’s most exceptional new talents. Grounded in a strong sense of authenticity, and featuring constant reminders of its setting in the Deep South, the movie feels real in a way that most action-based movies don’t. You’re used to seeing guns and shooting, often for entertainment, but here when you see a gun, you know blood might be shed, and there’s not a single character that you’d want to lose. The film is upfront about its sci-fi influences—if you squint, you can almost see the spectres of ‘80s Steven Spielberg and James Cameron—and also shares its basic plotline and distinctly American themes with Stephen King’s novel Firestarter, but it could hardly be confused with anyone else’s work. Like Nichols’ masterful Take Shelter, it stars Michael Shannon as a father trying to protect his family when confronted with a supernatural occurrence. The supernatural here comes in the form of his own son, Alton (Jaeden Lieberher), a boy of seemingly unlimited capabilities who can bring down a space satellite and draws information from an invisible parallel dimension. These powers catch the attention of both the U.S. government and the leader of a religious cult known as the Ranch, which leads the father, Roy, and his childhood friend Lucas (Joel Edgerton) to kidnap the boy from the cult and aid him in accomplishing his mysterious destiny. The film takes place mostly at night, daylight being dangerous to the boy’s well-being, which helps justify the title. Adam Stone, the cinematographer and Nichols’ regular collaborator, made no use of artificial lighting even in scenes that could have required it, which made light a recurring visual theme: when there is some, it is usually to denote fantasy or mystery, such as in the strong rays of light that the boy radiates through his eyes, or the appearance of the room in which he is at one point taken by the F.B.I. This light also signifies a certain hope amidst the darkness that surrounds the characters, and a strong positivity that can be taken away from the film: despite its genre influences, it is remarkable for arguably having no antagonist, and delivering a story that is fundamentally about its characters and the emotions of a father who fears losing his son, but is resolved to let him determine his own path. Midnight Special starts with no exposition, throwing you right in the middle of the action, and feeds you information by little pieces, which forces you to watch carefully and connect the dots. Dialogue is sparse and the tone understated, with wonderfully economical filmmaking that keeps you on the edge even when little is happening, while telling you no more than you need to know at any given point. If you can overlook some of the less convincing later developments, and even if you can’t, there is much to appreciate and admire on this unusual journey. Like young Alton, you can immediately tell that you’re in good hands.